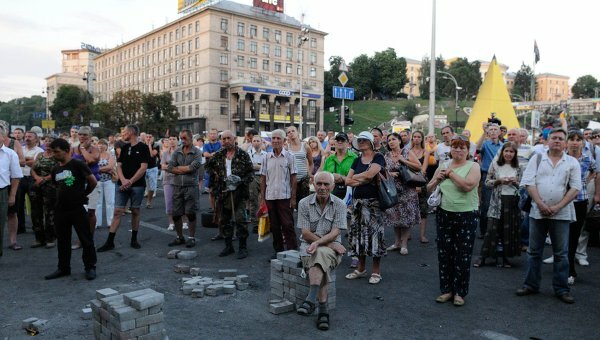 The activists still occupying Kiev’s Independence Square are protesting the new Kiev authorities and the government’s military operation in eastern Ukraine, a Euromaidan representative said Friday. “Why are factories and plants being closed? Why is the war underway? Nothing has changed under the new government; there is still no work and corruption is flourishing,” the representative said. In general, the protests on Independence Square are peaceful. However, on Thursday, Kiev attempted to dismantle barricades on the square, triggering clashes between the activists and police. Euromaidan defenders were seen throwing projectiles at law enforcement officers and firemen in a bid to force them out of the square and setting tires ablaze in several places. At least four police officers were injured in the clashes. Dozens of protestors are currently rebuilding the barricades that Kiev attempted to destroy. Protesters occupied Maidan Nezalezhnosti, or Independence Square, on November 21, 2013, after Ukraine’s Cabinet of Ministers announced an about-turn on the signing of a European Union association agreement. The so-called Euromaidan protests then spread across the country, resulting in violent armed clashes between radicals and the police, leading to about 100 deaths. 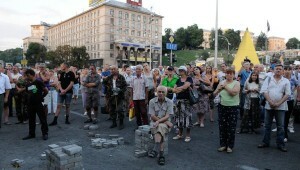 Even after Ukraine underwent a regime change in February, a number of protesters refused to leave the square. In mid-April, Kiev launched a military crackdown on independence supporters in eastern Ukraine. The conflict has claimed the lives of at least 1,367 people, according to the United Nations.